Here’s an example of a super-quick breakfast that I like to cook – Spaghetti Squash Scramble. It fits in with your paleo, low-carb, and Whole30 diets – and it tastes good too. 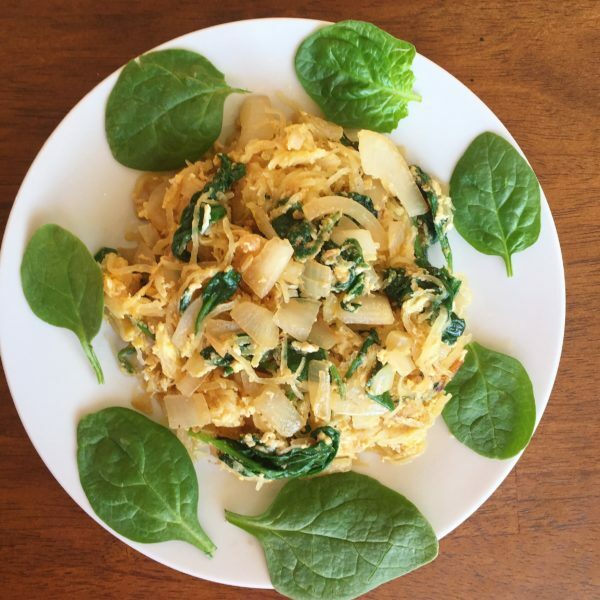 A simple scramble made with spinach, onions, spaghetti squash, and eggs. Heat the olive oil over medium heat in a large non-stick frying pan. Add the onion and cook for 4 to 5 minutes, or until the onions are translucent and lightly browned. Add the spinach, and stir until wilted. Add the spaghetti squash and toss with the other ingredients for 1 to 2 minutes until heated through. Add the eggs, cook for 1 to 2 minutes, then fold the ingredients around. Continue until the egg is set to your liking. Season with salt and pepper to taste; serve immediately. Of course, you can change up the veggies (or double/triple by adding more veggies and eggs) depending on your preferences or your crowd. But the key is – it’s quick, filling, nutritious, and keeps you on track with your plant-centric diet. What’s not to like? Looks and sounds like a really tasty dish. Wouldn’t mind having that this evening for dinner! Thanks for stopping by, Agness! Yes, this has turned out to be one of my favorite dishes!